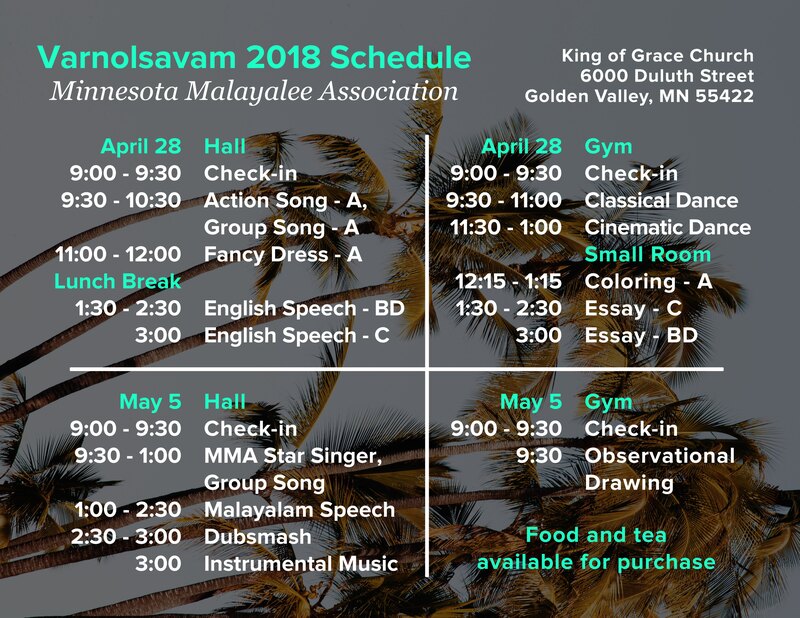 Here is the Varnolsavam 2018 Schedule for Saturday, April 28 and Saturday, May 5. Participants, please arrive at least 30 minutes prior to the start of your events. Viewers, you’re welcome to come and support the participants anytime during the competitions. This event is free to attend. Lunch and tea are available for purchase. Group A participants and Classical Dance participants must check-in at 9am on April 28. MMA Star Singer and Observational Drawing participants must check-in at 9am on May 5. Everyone else, please check-in 30 minutes prior to the start of your events. We have over a hundred participants this year, and we are running a tight schedule. It is crucial that participants arrive on time. We look forward to seeing all of you this Saturday and next Saturday!